Carolyn’s first book had little to do with the new developments in science. Instead, it was the culmination of a very old story. In 1999, she learned that the brain of Albert Einstein had been delivered to McMaster University for anatomical studies after rumbling over the Canadian border in the trunk of an old man’s car. The book was a finalist for the Governor General’s Literary Award for non-fiction, winner of the Canadian Science Writers’ Science in Society Book award, and now published in seven countries and four languages. The story begins in April 1955, when Thomas Stolz Harvey, chief pathologist at Princeton Hospital, found himself in charge of dissecting the cadaver of the greatest scientist of his age, perhaps of any age. He seized the opportunity to do something “noble.” Using an electric saw, Harvey sliced through the skull and gingerly removed the organ that would both define and haunt the rest of his life. Harvey struck a controversial deal with Einstein’s family to keep the brain, swearing to safeguard it from souvenir hunters and publicity seekers, and to make it available only for serious scientific inquiry. Not a neuroscientist himself, he became the unlikely custodian of this object of intense curiosity and speculation, and the self-styled bulwark against the relentless power of Einstein’s growing celebrity. Bridging the post-war era and the new millennium, Possessing Genius is the first comprehensive account of the circuitous path the brain took with Harvey during the decades it remained in his possession. Harvey permitted Einstein’s gray matter to be sliced, diced, probed, prodded, and weighed by those hoping to solve the enigma and locate the source of genius itself. The brain was more than a subject of scientific investigation, it was a kind of holy relic; the history of its adventures since 1955 reflects the vicissitudes and vanities underpinning what we believe makes us human. Abraham has gathered together all of the fascinating details and documents of the brain’s saga–including previously unpublished correspondence between Harvey and Otto Nathan, the executor of Einstein’s estate—and from them woven a story that is both deeply engrossing and highly illuminating. 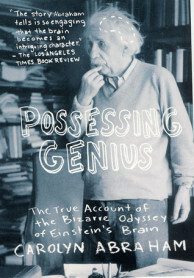 Interested in purchasing Possessing Genius online?